The Howling Diablos will be ringing in the New Year at the Royal Oak Music Theatre. Join them!! FLYER! . View Johnny's art at the Opening at the River's Edge Gallery on Friday, December 15th. Here's the flyer. Johnny and Sylvain Sylvain at a New York Dolls concert at the St. Andrews Hall, Detroit. Scrapbook!! Photos by Michael Spleet. Four new paintings added to the Gallery. #80, #81, #82, and #83. From Kid Rock's website an interview with the Howling Diablos See it here!!. Bee backstage with THE WHO. Roger Daltry and Zak Starkey. Pics taken by Sue Plummer. Scrapbook!! Johnny and the lovely Niagara at the Rivers Edge Gallery. In the scrapbook. Bee with Ron Cooke are backstage at the Emerald Ballroom in Mt. Clemens and meet Lindsey Buckingham from Fleetwood Mac. Check pics out at Bee's Scrapbook. See Bee with the Howling Diablos at the 8th Annual Motor City Blues & Boogie Woogie Festival - Friday, October 22nd, Royal Oak Theatre - Here's the flyer. Original Grande Ballroom featuring DETROIT from 1972 flyer1 and flyer2. Visit this website to see original gig and setlists from the Grande. Johnny's Art will be at the River's Edge Gallery, Sept. 15th thru October 30. Here's the flyer. Scott Harding, a fan of the Rockets, wrote in his Blog and sent it to Johnny to share. Check it out. Recent pic of Johnny and Joey Gaydos . Found three cool pics of The Rockets. Bee, Johnny-Fred-Henry, and Rockets 1978. Also added to Bee's Scrapbooks. That Diablos Tshirt strikes AGAIN at a vid at You TUBE . Cool pic of Johnny performing with the Howling Diablos at WCSX Rockin' on the River, Detroit's Campus Martius. In the Spring 06 issue of Backstreets Magazine, Johnny is featured with an article. Read it here. September 22, 23, and 24. Johnny's art will be displayed at The Summer Ditry Detroit Show. Click here to see the poster. Johnny's art will be displayed at the River's Edge Gallery on Friday, September 15th. See the flyer for details and location. 8/19/06 - Pics of Johnny with Joe Walsh - Check them out in Johnny's Friend's Scrapbook. 8/2/06 - Johnny tells us there's a new movie coming out this weekend and one of the actors is wearing a Howling Diablo's t-shirt through the whole movie.Here's alittle bit of the trailer for the news page. Also right after the WCSX gig this Friday, 8-4, they are doing a late night set at a club a block away from the Ren Cen called "Currents". The Howling Diablo's are playing at The Dream Cruise in Ferndale on the roof at Dino's at Nine Mile ad Woodward at 4:00p.m.on Aug.19th. THIS GIG HAS BEEN CANCELLED due to police "concerns" over citizens' safety!! Opening for Joe Walsh and The James Gang at DTE Energy Center on Tues.Aug.15th. You won't wanna miss this! Howling Diablos play at the Magic Bag, Saturday, 7-22-06, to celebrate thier vintage logo tee shirt being featured on the upcoming new Warner Bros. comedy coming out in August, Beerfest. Check out this very cool flyer!! and also the Press Release announcing this. Johnny met up with Eric Burden when he was in Detroit. Pics in his Scrapbook section. Check out this vintage video of Mitch Ryder and the Detroit Wheels on Hullabaloo. Courtesy of "You Tube" website. Look really hard and you will see Johnny!! Johnny is playing at the Windsor Blues Festival , on Friday, July 14th with Mark Pazman and his super session band. They will be opening for the Yardbirds and David Clayton Thomas and Robin Trower. These are just some of the acts. Check him out! See pics of Johnny with Edgar Winter and Nils Lofgren. Taken in Detroit, June 2006. Visit the Scrapbook. Check out the contents of a review on Car Wash, the latest by the Howling Diablos, right here. Speaking of the Howling Diablos, here's the list of the gigs for Summer 2006. The River's Edge Gallery in Wyandotte now has some of Johnny's Art. Interesting read of a message board post by a Katon fan. Johnny has 3 new paintings to share with you. Go check them out in his gallery. #77-Dark Globe, #78-Earth, and #79-Heavenly Dispair. Johnny went to see Leslie West and Mountain at the Magic Bag on May 1st. Couple of pics of him and the band are added to his Scrapbook. bands, Eric Burden and the Animals and Ray Davies are on the bill this year. Three new paintings added to the Gallery. #74, #75, and #76. Johnny has a new painting titled "Planet". #73 - added to his Gallery. Johnny has his own Burnlounge store for Music Downloads. Check it out! At the Superbowl Party in Detroit, Bob Ezrin meets up with Bee and Ron Cooke. Bob produced Alice Cooper, Pink Floyd, Lou Reed, Detroit and hundreds of other great artists. See his pic with Bee in the Scrapbook under Musician Friends . Bee In Europe. More pics added from his tour with the Michael Katon Group. Plus a link http://gallery.debosuil.nl/Michael-Katon to view more on another website. Bee In Europe. Some pics from his tour with the Michael Katon Group. DIABLOS GETTING SPINS IN BUDAPEST! See the DJ lineup here. Review from The Mayfair Mall Zine, in the UK, of Michael Katon's latest CD. List of gigs for Johnny's European Tour with Michael Katon. Starting Fri, Feb. 10th. Here's a review from the UK of the Howling Diablos, latest - Car Wash.
Also added to Bee's growing Scrapbook of Friends is a pic of Johnny with the great legend Leland Sklar. Added to Bee's Scrapbook of pics is Johnny at I-Rock playing a gig with the Howling Diablo's. 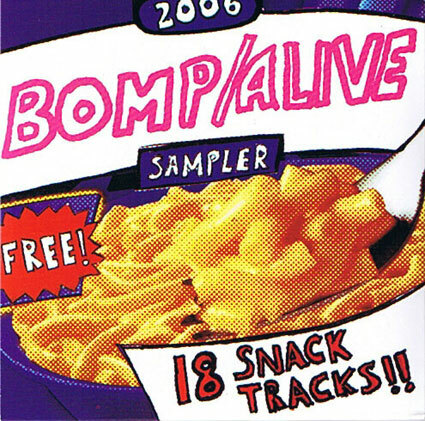 Here's a copy of the cover from the new Bomp/Alive Records C.D. complilation that just came out last week. The director of the Dukes of Hazzard movie (and Jessica Simpson) in his Howling Diablo t-shirt. Detroit's Howling Diablos have become huge Hollywood favorites! The new DVD of "Dukes of Hazzard" hit the streets worldwide on Warner Bros. The DVD contains extra Special Features segments about the making of the movie featuring Director Jay Chandrasekhar wearing his favorite band's t-shirt: The Howling Diablos. Jay talks to the cameras and his stars, Jessica Simpson, Johnny Knoxville, Burt Reynolds, and Willie Nelson sporting his Diablos black T! Director Chandrasekhar has been known to sport his original Diablos T on the sets of his other hit films, "SuperTroopers" and "Club Dread". Now the famous shirt has made it onto DVD! Detroit Rock City! See Johnny's art on Feb. 4th at the Corktown Tavern. "Punk Art" will be featured by nine different artists. Five punk bands will play. The Howling Diablo's will be headlining the Motown Winterblast on February 3, 2006. They will be performing at 9:30 PM on the Rock Stage Lineup. Artwork #68 "Cobwebs" has been added to Bee's Gallery.